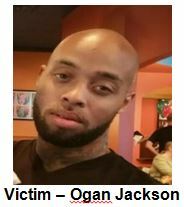 One year ago today, on July 13, 2016, the victim, Ogan Jackson, a Black male, 32-years-old, was shot and killed at 4845 Elsie Faye Heggins Street. After shooting the victim, the suspects took his property. Anyone with information regarding this offense is encouraged to contact Homicide Detective Lopez, #7021, at 214-671-3693 or eddie.lopez@dpd.ci.dallas.tx.us. Please refer to case #169349-2016.